BackgroundRadiologists' training is based on intensive practice and can be improved with the use of diagnostic training systems. However, existing systems typically require laboriously prepared training cases and lack integration into the clinical environment with a proper learning scenario. Consequently, diagnostic training systems advancing decision-making skills are not well established in radiological education.MethodsWe investigated didactic concepts and appraised methods appropriate to the radiology domain, as follows: (i) Adult learning theories stress the importance of work-related practice gained in a team of problem-solvers; (ii) Case-based reasoning (CBR) parallels the human problem-solving process; (iii) Content-based image retrieval (CBIR) can be useful for computer-aided diagnosis (CAD). To overcome the known drawbacks of existing learning systems, we developed the concept of image-based case retrieval for radiological education (IBCR-RE). The IBCR-RE diagnostic training is embedded into a didactic framework based on the Seven Jump approach, which is well established in problem-based learning (PBL). 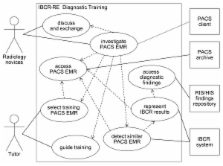 In order to provide a learning environment that is as similar as possible to radiological practice, we have analysed the radiological workflow and environment.ResultsWe mapped the IBCR-RE diagnostic training approach into the Image Retrieval in Medical Applications (IRMA) framework, resulting in the proposed concept of the IRMAdiag training application. IRMAdiag makes use of the modular structure of IRMA and comprises (i) the IRMA core, i.e., the IRMA CBIR engine; and (ii) the IRMAcon viewer. We propose embedding IRMAdiag into hospital information technology (IT) infrastructure using the standard protocols Digital Imaging and Communications in Medicine (DICOM) and Health Level Seven (HL7). Furthermore, we present a case description and a scheme of planned evaluations to comprehensively assess the system.ConclusionsThe IBCR-RE paradigm incorporates a novel combination of essential aspects of diagnostic learning in radiology: (i) Provision of work-relevant experiences in a training environment integrated into the radiologist's working context; (ii) Up-to-date training cases that do not require cumbersome preparation because they are provided by routinely generated electronic medical records; (iii) Support of the way adults learn while remaining suitable for the patient- and problem-oriented nature of medicine. Future work will address unanswered questions to complete the implementation of the IRMAdiag trainer. The effects of problem-based learning during medical school on physician competency: a systematic review. Systematic reviews on the effects of problem-based learning have been limited to knowledge competency either during medical school or postgraduate training. We conducted a systematic review of evidence of the effects that problem-based learning during medical school had on physician competencies after graduation. We searched MEDLINE, EMBASE, CINAHL, PsycINFO, Cochrane Databases, and the tables of contents of 5 major medical education journals from earliest available date through Oct. 31, 2006. We included studies in our review if they met the following criteria: problem-based learning was a teaching method in medical school, physician competencies were assessed after graduation and a control group of graduates of traditional curricula was used. We developed a scoring system to assess the quality of the studies, categorized competencies into 8 thematic dimensions and used a second system to determine the level of evidence for each competency assessed. Our search yielded 102 articles, of which 15 met inclusion criteria after full text review. Only 13 studies entered final systematic analysis because 2 studies reported their findings in 2 articles. According to self-assessments, 8 of 37 competencies had strong evidence in support of problem-based learning. Observed assessments had 7 competencies with strong evidence. In both groups, most of these competencies were in the social and cognitive dimensions. Only 4 competencies had moderate to strong levels of evidence in support of problem-based learning for both self-and observed assessments: coping with uncertainty (strong), appreciation of legal and ethical aspects of health care (strong), communication skills (moderate and strong respectively) and self-directed continuing learning (moderate). Problem-based learning during medical school has positive effects on physician competency after graduation, mainly in social and cognitive dimensions. Copyright statement: Copyright ©2011 Welter et al; licensee BioMed Central Ltd.
A train-the-trainer model for integrating evidence-based medicine training into podiatric medical education. Problem-based learning and teaching of medical pharmacology.